Subject: Pictures of the actual shipped item. My copy arrived this morning, and I have just uploaded some quick pictures of the components; currently waiting for approval. I realise that there will be more artful pictures taken later, but for anyone who just wants a look in the box, hopefully it will suffice. First impressions, having only examined the components. Generally, it looks nice. Jayne's heroic pose is (I think) meant to be him running and firing, but actually looks like he has just tripped on something. I love the idea of the buildings being both a modular component tray and also dressing for the scenarios. My only concern is that they don't seem to be made of particularly strong card; time will tell how they will stand the test of time. 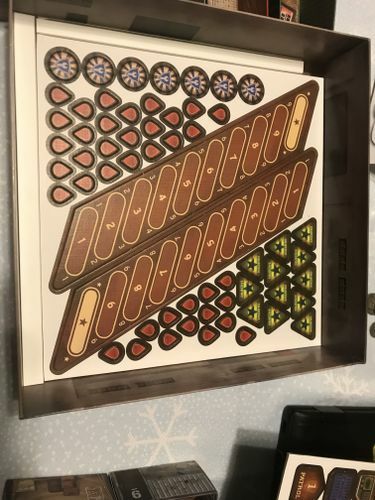 I was surprised that the game only came with 4 jobs, but I haven't read the rules yet, so maybe I am missing something. I'd gained the impression that you kind of played the series. But all in all, it looks good, and I am looking forward to trying it out. 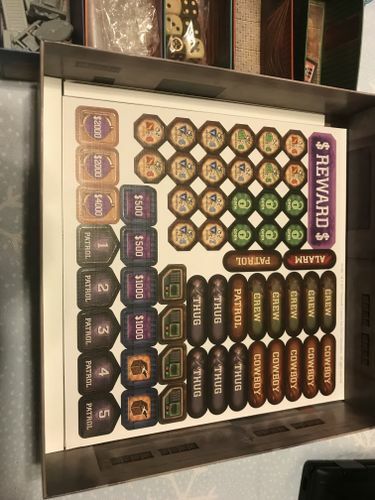 Yes it doesnt come with many jobs, gf9 counts on bringing out expansions to bring more content and jobs, this box is basically just a starter set. 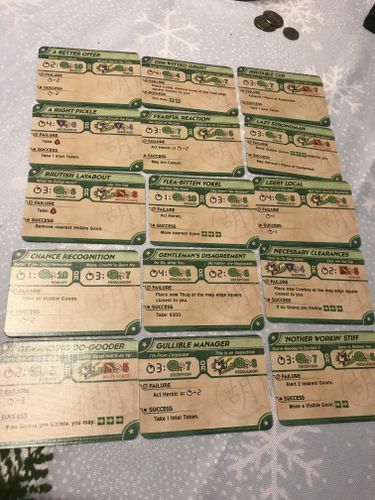 Do you have the pre-order incentive minis? If so, how do they look? Way Cool. Pictures look great, and the container/buildings are just super shiny. 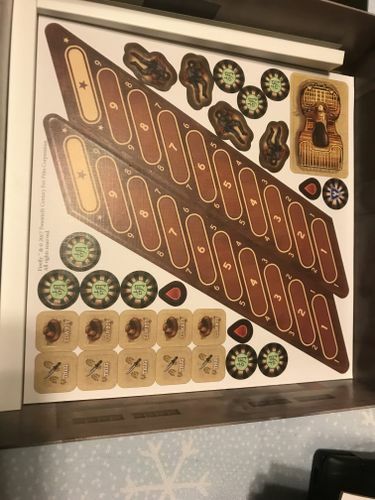 I didn't see any pictures of the Bonus miniatures, and does a game board come with it? if so, how big is it? 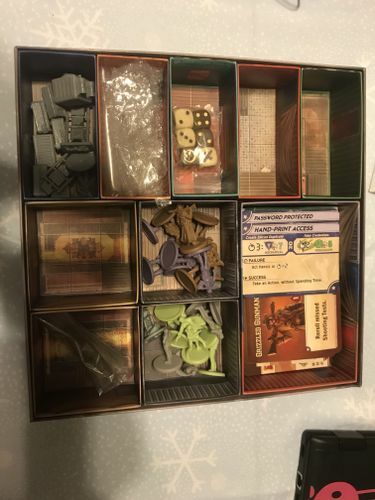 The bonus minis are crates and stuff in the main, plus a hostage and a "naked thinker Mal". I've uploaded a picture of the setup for the hostage mission - you can just about see a terminal (in the middle building) and the hostage (big building to the bottom). 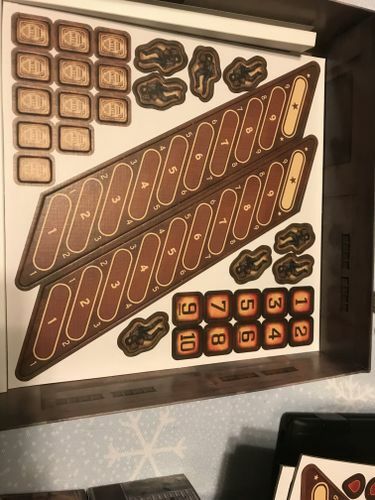 Game comes with six 1 foot square boards with different terrain on both sides. There are a couple road sections, one landing field, the rest are essentially desert and/or concrete. how many crates did you receive? 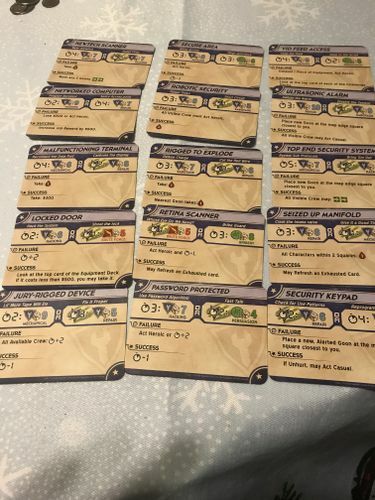 The facebook pre-order picture showed six but i received 5 with mine. I received 6 crates. I am currently uncertain as to whether I will use them as the casting isn't great so after a few games it will be easy to spot at a glance which is which however with a little greenstuff and a coat of paint they may be okay. you will forgive me, but i'm not much of a miniature person. what do you mean about easy to spot at a glance which is which? I don't have them to hand but can grab a photo later. To explain better it's actually because of the use in the game. Each crate has an icon on the base to reflect what the crate contains such as different amounts of credits or an item. This means that both sets of 3 crates should look identical so you can't tell which is which without turning them over, unfortunately the quality of the model casting means that each crate has distinguishing marks so that you can tell just by looking at them what they will contain. 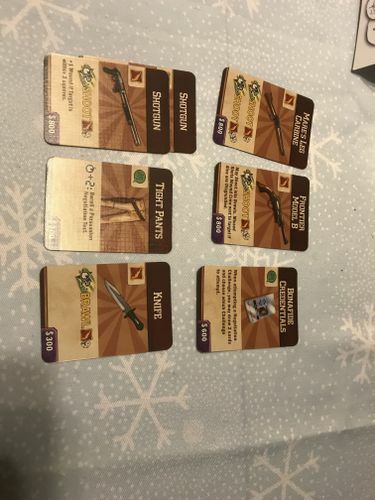 These models are purely a bonus as you can use card tokens from the box to do the same job so it doesn't ruin the game, just makes the miniatures harder to use. Thanks for posting. This is SHINY news!! Yeah, I wasn't that impressed with the casting quality of the promo items that I got today. Naked Mal's got some weird things attached to his legs. What you could do is to paint the crates any way you want and then shuffle/put the tokens under them. Whatever is on the token is what actually counts and the crates become more of a cosmetic replacement only. That's what I did with Descent so I could have different looking chests, piles of junk, etc. on top of search tokens. Do the promos come in a separate shipment? My box just arrived with only the main game. They should be wrapped in bubble wrap, separate from the main box. Check to make sure you haven't thrown them away with any packaging! Some pics. They're not great, but they're something. I did not include pics of components that are pretty clearly depicted elsewhere. 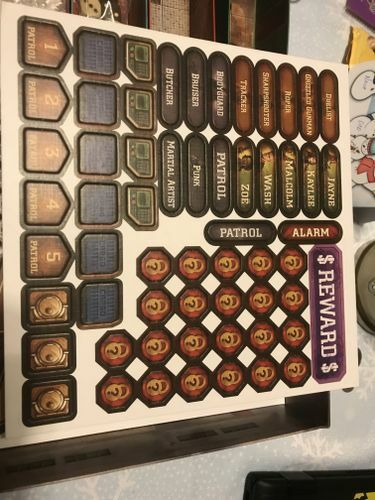 There are 4 different sheets of tokens. This is one side of the first. 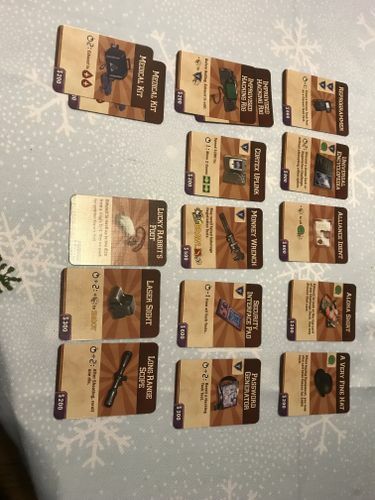 40 equipment cards. If you do a quick count, you'll see that I only have 39. A very patience representative at GF9 determined that I was missing a second Knife and is shipping it. The Negotiate-themed Challenge cards. If you're familiar with the original game, you'll see that these differ a bit from Misbehaves in that they're more specific. Whereas the Misbehaves depict sort of situations, these are more like dealing with a specific individual or discrete event. Same with the Tech Challenges. Rather than, say, the situation of "Tight Security," you're dealing with a specific counter-measure - Chemical Detectors or a Com Interface. Wow G, got yours hu? 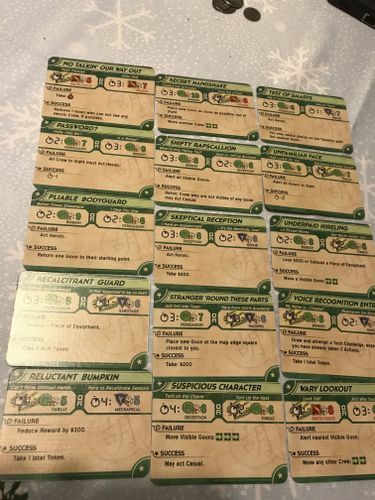 lots of tokens there (seeing a theme here in GF9 games), can't wait for Monday (when mine is supposed to come in). looking at that first picture, i'm a tad worried about some of the miniatures, may need to drop them off with one of my local 40K players to get the flash and stuff cleaned up. how sturdy are the "buildings"? think they'll hold up well under double duty? with them just previewing the summer set's on FB, i'm also going to be curious about the "box-bottom building" that they will come with. can't wait to read your review of the game. Got to say in the unboxing vids I've seen the minis look awful - lacking in detail. Is that the same for everyone? The video camera is out of focus. They have fair detail typical of soft plastic minis. I have the same problem with my minis. I emailed GF9 on Saturday, today they responded asking for pictures for their records. Not sure anything will come from this, but at least they know about it. To be fair to GF9, I did get an automated response to my email. Seeing as Ashitaka has reported the same issue and GF9 has reached out, I am holding out hope that they will do something to make this right for those of us that pre-ordered. In the meantime, I think we will still use the chests, but randomly draw the cardboard chits to see what is in the chests. 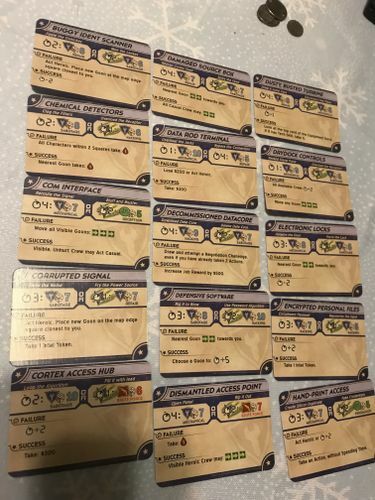 In regards to the promo Firefly game cards, they are located inside the actual game box and not in the shipping box. They are not in the same bag as the minis. 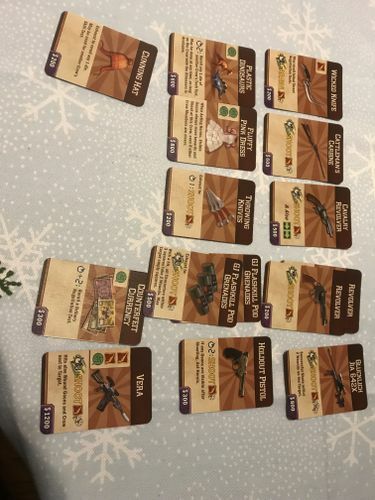 Can you say what size of the cards, please? So since rules aren't available apparently, I'm trying to get a sense of gameplay. Guessing missions are likely moving around doing certain steps in order (making skill checks? fighting?). Would love to see a pic of the 4 missions so I can get an idea of what's involved. If there were pictures posted of them, I missed it.